Getting a property-tax bill is never fun; in Chicago, it’s excruciating. The debt summary printed on every bill packs quite a wallop. It’s truly frightful to behold. On the left are the taxing districts: the city and county governing bodies that derive at least part of their revenue by taxing our properties. The next column states the debt of each entity. The debt levels range from a relatively modest $287 million at the Cook County Forest Preserve District to $3 billion at the Water Reclamation Board on up to $13 billion at the Chicago Board of Education. Top of the heap is the City of Chicago, which is $36 billion in the red. While an explosively compounding debt is strangling each of these entities, here’s the most mind-boggling fact: all their debt burdens together (in addition to those of the state of Illinois, which are thankfully absent from the property bill!) rest on the backs of Chicago taxpayers. 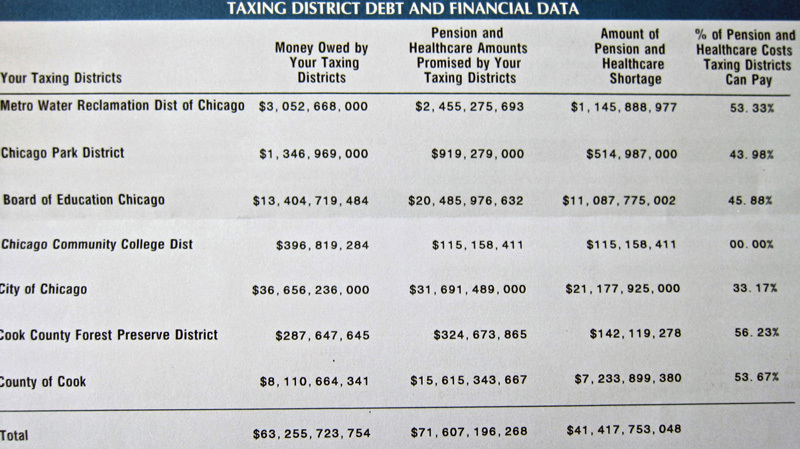 The total debt saddling metropolitan Chicago collectively is over 63 billion dollars. Of the various entities we are beholden to, the Community College system runs most responsibly: its debt is only $400 million. The chart’s third and fourth columns list the excessive pension and healthcare benefits that our governmental bodies have promised to their employees. The fifth column shows the funded pension and healthcare obligations as a percentage of what’s owing. All our governing entities have awarded compensation deals to their employees that are far beyond their means. The City of Chicago can meet only 33% of its obligations; the community-college system, zero. What story of pork lies behind the $2.5 billion obligation of the Metropolitan Water Reclamation District (MWRD), an operation that has something like 2,200 employees? Back in 2010, Dan Mihalopoulos and Patrick Rehkamp, writing in the New York Times, detailed the handsome salaries and benefits that typify compensation at the MWRD, which generally far outstrip what similarly skilled city personnel receive. Yet one would never guess that anything is awry with the finances of the MWRD, for it continues to plow ahead with all sorts of attractive and appealing initiatives—the kind identified with a progressive ‘world-class’ city. Yet the fact that Chicago’s budget is so out of whack establishes that our officials are still purely bush league. Over the decades, municipal officers have taken on obligations, engaged in spending, and made promises to employees irresponsibly. For the sake of re-election, ambition, or warped city pride, our leaders—the mayor, the Cook County Board, the Board of Education, even the Park District—have gotten way beyond themselves when it comes to spending. Even now, their spending continues because, structurally, the citizenry cannot check their power. The mayor and everyone else at the helm of municipal government behaves as though encased inside a dreamy impervious bubble, that no amount of popular rage can burst. New bums will replace the old bums, even if we succeed in throwing the bums out at election time. Eventually, Chicagoans will vote with their feet, then—voila!—the financial bubble of municipal government will finally burst. Fortunately it’s a good time to sell. Yes, the city and county are in terrible financial shape. Our household received the same thing—along with a huge property-tax bill to pay! UGH! . . . . Quite a timely post—thanks for drawing attention to the matter. I can’t imagine how it will end. New York nearly went bankrupt back in the 70s, I think; it marked a turning point for the city and now it is much better run.